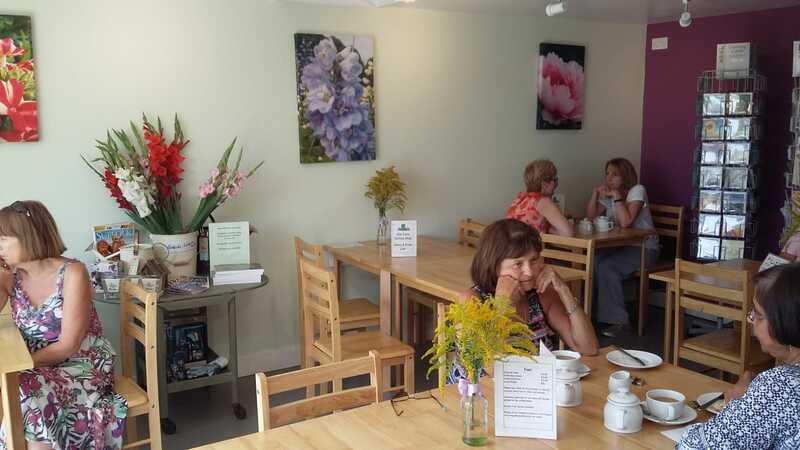 Our Coffee Shop is open seven days a week 10am until 4pm. We try to use our own flowers or seasonal plants to decorate our tables all year round. We offer Paddy and Scott's Coffee, Chocolate, Tea Pigs Tea and cold drinks. Between 12 and 2.30pm we offer a selection of sandwiches and soups. As much as possible, we use local producers. Our bread is from Martin's Bakers, Woodbridge Road, Stokes sauces, Woodbridge, Fruits of Suffolk Jam, Fairfields Farm Crisps from Colchester, Mim's bakes from Henley and, of course, Paddy and Scotts is local too! We now have Paddy and Scott's takeaway cups available. We are pleased these are fully compostable but you are most welcome to bring your own cups for us to fill. Drinks are 50p cheaper to take away than in the shop. We believe that gardening and being outside is therapeutic in many ways and so we hope that you will be able to enjoy our setting among the flowers. We have outside seating in the summer. Well behaved dogs are always welcome, inside and out. A big 'thank you' to everyone who came down and supported our Macmillan Coffee Morning this September. You helped us raise £406.